Happy first day of May, everyone! 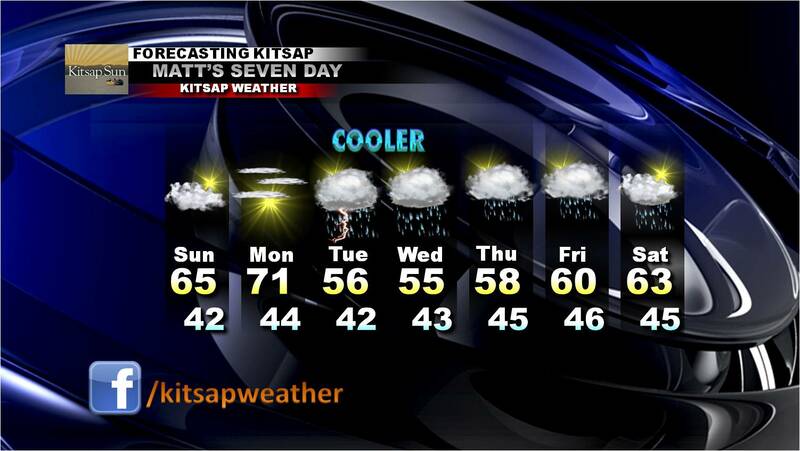 You would never have guessed it was May just by looking outside, however, as temperatures fell into the upper 20s and lower 30s across the Kitsap Peninsula. And I’ll admit it, I was pretty ticked about having to scrape my windshield so late in the spring. Frosts in April are not unusual, but frosts in May are practically unheard of! Are you ready for a little more in the way of extremes? 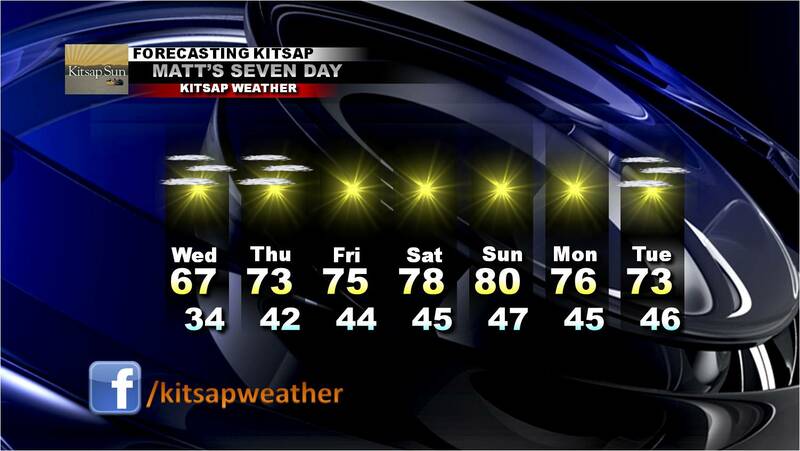 I’ve been tracking forecast models that indicate we could get unseasonably warm by this weekend. So warm, in fact, that we will likely experience the warmest start to May in at least 15 years. Then again, this time of year we don’t have access to a whole lot of “oomph” in the heat department, so we have to make do with what little heat we get. Still, though, I’m sure many of you would consider temperatures in the upper 70s to lower 80s “oomph” enough. This is a snapshot of Sunday evening at 5 pm. Temperatures are very similar for Saturday as well. As you can see, the pink colors indicate temperatures in the mid to upper 70s, but the lighter pink into white colors suggest temperatures in the 80s. Indeed, some Kitsap locations, although not all, have a decent shot at reaching 80 degrees or above over the weekend. 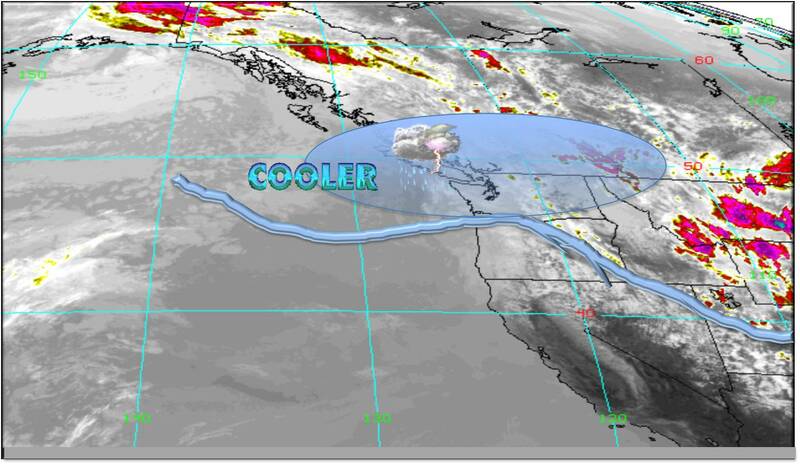 This is enhanced by what is called “offshore flow,” which brings in the warmer air from over the Cascades from Eastern Washington into our neck of the woods. This same flow brings us the cold eastern air in the winter. Wednesday through Friday we’ll slowly warm from the upper 60s to mid 70s, with warmer weather over the weekend, only cooling off slightly into early next week. Enjoy the warmth and start planning those weekend activities!